I finally bought myself a decent 42" plasma TV. Windows 7 Home Premium was also purchased, and this has media centre, so I guess this was all the incentive I needed to build myself a Windows 7 Media Centre PC. Windows 7 Home Premium and Windows 7 Pro both come with Media Centre software. 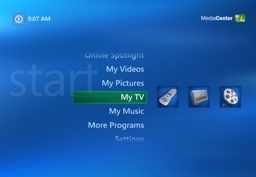 This is designed to be put up onto your TV, allowing you access to your music, photos and video. First thing I needed was a PC. Luckily I have a Pentium 4 HT processor here, with 2Gb of Ram. It's a nice HPDX2200, with a multimemory card reader. That should come in handy when I need to upload photos straight to media centre from my cameras. It's noisy, and as I want my media centre left on, recording video, in the lounge, the first thing I need to do is dampen down the noise. So purchase number 1, from the online distie, a 420W large fan Power Supply Unit from Trust. It's compatible for most PCs, and has a large 120mm cooling fan. Quote "Extreme Low Noise". Just what I needed. £12. Not bad. Next purchase was the Processor Fan. That thing has been getting noisier for some time, so was already due a swap out. Off I went to the local store in seach of amazingly quiet cooling mechanisms. Took my PC apart - it has two fans - one covers the processor and one blows air over the processor! The other fan was the extra graphics card I put it a while ago! That was the cheap, small noisey one. Next, some speaker foam. That should dampen down my media centre PC noise levels! Speaker foam is too expensive, and it is really just packaging foam. So some double sided tape and I've lined the internal "bottom and side" of the media centre with sound reducing foam! Next purchase, a Windows Media Centre PC remote controller. A simple must to sit back and make that media centre sing. Ebay - a great source for these sort of object. Finally, a purchase of decent tuner/tv card. I was a small buy when hauppauge made a tv card. So there are still are, I'm off to buy TV card for my media centre. I am not about to backup my PC, ready to transfer to my fresh new workstation. The CD is ready, and I am going to format my drive with Windows 7 Home Premium. Get the drivers working, and when run up Windows 7 Media Centre. Come back for Part II - and I will let you know it all went. 1. 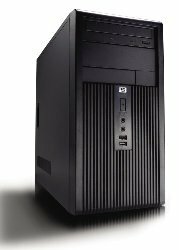 HP DX2200 2Gb Ram, Sata Drive, 3.4Gb Hz CPU.